In the article, Bartle describes three philosophies or design approaches that have influenced the work of designing Virtual Worlds. Based on three major fictional works, Alice in Wonderland, Dorothy from Oz, and Wendy in Neverland, Bartle identifies differences and commonalities and discusses their ability to “play together”. It’s important to notice that Bartle is addressing a game (world) designer audience, and that Bartle’s work in general has focused on Virtual Worlds designed with the explicit intent to entertain the players – fun is the key motivation for using such worlds. In the table below, I’ve tried to summarize some of Bartle’s points. Without going too much into detail with the table here in this post, I think it’s important to notice a couple of things in order to understand what follows. In terms of “appeal” this should be seen in the light of immediate attraction, does the world attract and more importantly retain newbies? Evidently, a Dorothy world like WoW (with millions of active players) also appeals to oldbies, the kind of players who find joy and interest in “leveling up”, the kind Bartle calls “Achievers” (as we shall see further down). The table also shows why SL has problems when it comes to retaining users (with approx. 20 mio. accounts, but less than 100.000 concurrent users on a daily basis, there is a problem). Judging from the table, SL’s credo “Your World, Your Imagination” becomes a double-edged sword. The lack of a fixed narrative leaves the SL-user completely on his/her own to come up with a reason to play/stay. This problem, however, is not unique to SL, but points to a classic dilemma between the different needs of newbies and oldbies. Following from this, the next question that comes to mind then is: what motivates Wendy? or more precisely, why do users find interest in SL and what do they do in SL? 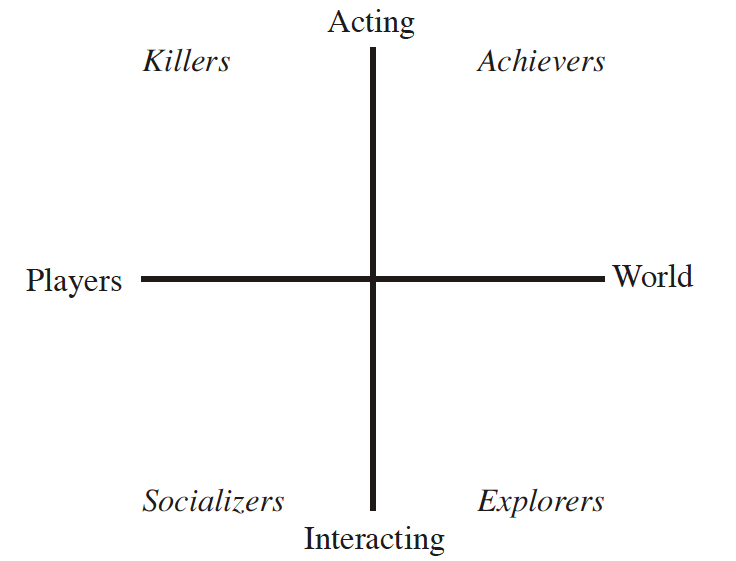 The graph describes players in terms of two dimensions: how they prefer acting on things as opposed to interacting with, and how they prefer to direct their attentions toward other players. When trying to apply this graph to SL, I see three issues that don’t match. The term “players” indicates that there is a game to be played**. The category “killers” implies a combat game-type world. Users is my personal preference. Linden Lab calls its users “residents”, and many experienced users in SL refer to themselves as “residents” – I do too. It is, however, a problematic term. My observations and research data clearly show that many (especially newbies, but not only) feel homeless and marginalized from the general SL community (but this has to be the topic of another post). 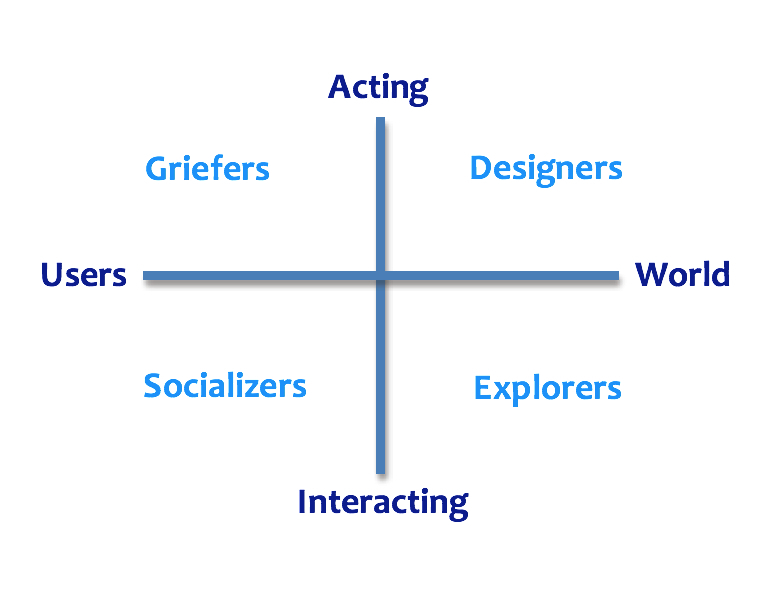 Griefers is a term borrowed from the game worlds, it is, however, how we define trouble-makers in SL too, and the term is also used in academic writings on SL (i.e. Boellstorff, 2008). I did consider the Internet term “troll”, but since trolls seem to be deliberately malicious, and my experience with (some) griefers is that they often have more humorous intentions (albeit still annoying to those they act upon), I discarded it. Designers refers to the SL users, who well … design things (buildings, art, clothes, animations etc.). I did consider the term “producers”, but in my opinion the socializers also produce and contribute to the content of SL. Compared to Bartle’s achievers, there are some interesting similarities. Designers also aim at mastering and acting upon the world, and even though there is no leveling system in SL, the mastery also results in high scores in terms of social capital (cf. Huvila et al, 2010). *) Bartle uses the term to refer to skills, rather than (malicious) intentions. **) Yes, I’m aware of Linden Realms and the many RP-communities in SL, but that still doesn’t make it a game per se. Bartle, R.A. (no date): Virtual Worlds: Why People Play. Bartle, R.A. (1996): Hearts, Clubs, Diamonds, Spades: Players who suit MUDs. 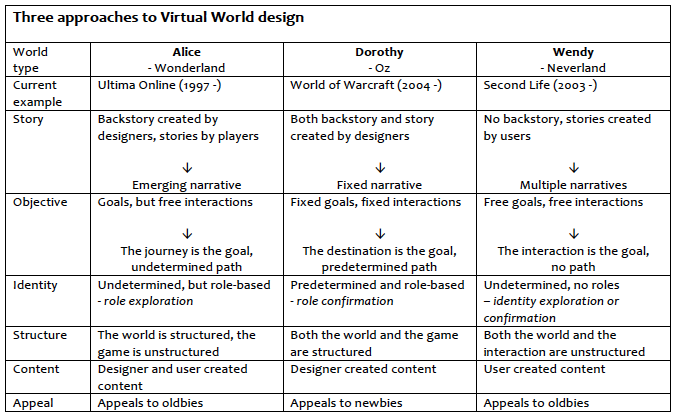 Bartle, R.A. (2004): Designing Virtual Worlds. New Riders. Boellstorff, T. (2008): Coming of age in Second Life. An anthropologist explores the virtually human. Princeton University Press. Suggestion. “Designers” could instead be renamed to “Content makers” ? I think I can follow you. Just by attending a virtual world, you are contributing to the content (environment). By your actions, chat and movements, but not building a pixel object, one could argue, you are still creating content. What you are describing, Mirror World, is the difference between player-created content and player-generated content. Player-created content is content created explicitly by players, which in SL terms usually means objects, functionality, landscapes and so on. Player-generated content is content that is created implicitly by interactions between players. If you walk into a location full of players dancing and joking, that’s effectively content for you – user-generated, but not user-created. Drama caused by people falling out with each other is also user-generated content. Thank you Richard. Yes, I understood, and I can see the challenge is to come up with a good short descriptive word. Usually I see “Content creators” used, for people that create a virtual object, like a dress, building or art piece. Those you refer to as “Player-created content”. I haven’t really thought about gamification in any formal way, but it’s been on my mind lately. I have a sense that gamification is a sort of “conceptual capitalism.” What I mean by that is, that analogous to the way that memes are the idea parallel to biological genes… perhaps gamification is the idea parellel to physical capitalism. So in capitalism, we are very productive, but there’s a tendency to become obsessed with the extrinsic thing, money, at the expense of the intrinsic thing: the values, goals, aesthetics, and ideologies that we thought our life was about. And analogously it seems like the current and coming gamification of everything tends to help us focus on the extrinsic, experience points, and less so on the more fundamental things that our life, work, and leisure are putatively about. Anyway, as for your post, I do think about “Dorothy” vs “Wendy” a lot. I have heard so many remarkable stories about not just leveling or XP in worlds like WoW, but in all sorts of interactions and community building. My friend Ironyca has been judging Transmogrification Festivals there lately, I’m not sure if that’s “Player-Created” or “Player-Generated,” but it is taking the elements of a world as provided, and creating new or at least unexpected paradigms from them. in spite of all that fantastic activity, I personally am so not a gamer. With no disrespect for all that compelling work and just plain fun, to be honest, a world like WoW just feels mostly tedious to me… whereas, hours of rants about the fitness of the platform notwithstanding, a world like Second Life just feels so exciting and full of creative possibilities to me. Great blog post, and WoW, so much compelling work here on your site, Thank You! The Transmogrification Festivals sounds really fascinating, I have to admit that I had never even heard that word, but if I understand it correctly it sounds great to try to push the limits of the game. That’s also what keeps fascinating me about users/players of almost any system: they always try to use the way they feel it fits their particular needs – regardless of how the system was intended. Yes, Richard’s distinction between “Player-Created” and “Player-Generated,” content is quite interesting because it also gives credit to those who don’t create content in the common sense, but who nonetheless contribute to the game/world. In a funny way it reminds me of one of Richard Stallman’s famous ideas, that he hated when passwords came to MIT, because he didn’t want the person who was sitting there yesterday, to be able to determine what the person who was sitting there today was able to do or not do. So passwords and administrators, game designers and content, these are all overarching power wielding roles, yet the person on the ground here and now… it is, should be, perhaps must be, their experience in their world and in their own time. Perhaps this even extends to the University White Board. If the equation or poem on the white board is so powerful, so insightful, so compelling, that you don’t have the nerve to erase it, then you’ve become a parishioner on your knees and not a writer. I’m really glad we don’t do much book burning, still, we need the freedom (informed by history) to write our own equations and our own poems, here, in our time. There’s a tendency to see social worlds as distinct from game worlds, because in social worlds everyone can create content but in game worlds only the designers can create it (although in both cases everyone can generate it). However, if you think about it, social worlds are just pushing the creation one level down: yes, people can create content in a social world, but can other people create content in the content they so create? Game worlds, which are created embedded within the real world, have designers. Worlds that are created embedded within social worlds also have designers. The social world is a platform. You can nest worlds-within-worlds as much as you like, but eventually you’ll have someone create a world that they don’t want other people to create things within. All that social worlds do ismove the creative act from the real world to a world hosted by the real world. Interesting point about pushing the creation down, Richard. In SL, creators can literally make their objects modifiable, but my impression is that this mainly applies to content you have to pay for, whereas freebies often can’t be modified (although there are exceptions in both cases). In this respect a lot of content remains proprietary. Another interesting aspect of this has to do with quality. For some reason, your comment reminded me of the so-called “folding stories” that I used to engage in as a child – the outcome was often quite unexpected, typically very funny, but oftentimes also incomprehensible. The quality seemed to be related more to the act of creating something together, rather than the actual outcome. I imagine that in text-based worlds the quality assessment of the narrative also oscillates between these poles, between players who are in it for the journey and players who are in it for the destination – not only at the Alice and Dorothy meta-level, but also within the worlds? Hold a comment in the queue if it contains X or more links.